Deontay Wilder kept his win streak alive Saturday night at the MGM Grand, Las Vegas, NV. Despite his victory, he disappointed some when he failed to kayo Bermane Stiverne to keep his streak alive. On the other hand, he demonstrated his endurance by totally dominating Stiverne over the course of 12 rounds. Stiverne was sure that if he could take Wilder into deep water, Wilder would tire and be vulnerable to the knockout. But, as is always the case, the water rose over the shorter man’s head first. The compact Stiverne was the one submerged and gurgling. He stumbled around pushing his punches like he was underwater. Wilder was enjoying himself grinning and at the ease. He was making a monkey out of Stiverne., winning just about every round. He had Stiverne in trouble on more than one occasion, and used his reach to keep Stiverne at bay, piling up points with his jab. 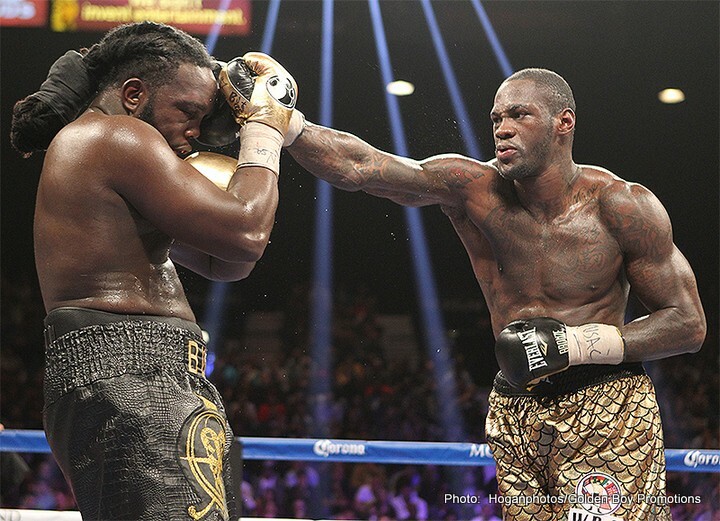 Stiverne’s toughness enabled Wilder to showcase his athleticism. He stymied Stiverne with his ability to gracefully move in all directions. That movement kept the fight at his distance. He fought tall, using his long jab, and preventing Stiverne from using his. Wilder’s jab had snap, power and accuracy. He used it to blast through Stiverne’s peak-a-boo defense. Other times, Wilder used it to temporarily conceal the flight of his hard right. He mixed it up too, sometimes going up the middle with a straight right, and other times arcing it around the glove of Stiverne. Wilder made sure the judges knew who was winning rounds. At the sound of the ten second warning, he would explode with combinations, eliminating any possibility Stiverne might steal a round. On those few occasions when Stiverne would attempt to throw a combination, Wilder would make him miss, and counter with the more accurate shots. Wilder’s chin was tested a few times by both left hooks and big right hands. But, there was never any sign that he was troubled by the punches. Throughout the fight he maintained his composure, and confidently showed his talents by making Stivene look slow. He would block and slip punches, and use a snap-a-way move when warranted. For much of the fight, Stiverne was being led around the ring on a leash. He couldn’t get past Willder’s jab, and by failing to cut off the ring he wasn’t in a position to attack Wilder’s body. All of which meant a relatively easy night for Wilder, so much so that in the post-fight interview with Jim Grey, he said he was ready to fight again “now”. It would seem Wilder answered questions posed by his doubters concerning his stamina and technical skills. Prior to Saturday, even his ardent fans had to admit that his 32-0 record was over a bunch of nobodies. Does his convincing one-sided victory over Stiverne provide positive answers to all the questions? After all, Stiverne was a title holder, and didn’t he punch Chris Arreola’s lights out? But, that’s pretty much the extent of his victories over quality opponents. Another question concerns Stiverne’s performance. Did he perform poorly because of Wilder’s superiority, or was he incapable of fighting any better. His “loser’s limp” excuse has already surfaced with his claim of having been severely dehydrated, which of course makes no sense. Fans are still left to wonder whether Wilder can perform as well against a quality opponent who is capable of taking away his jab, cutting off the ring, and dealing with his height and reach. If Wilder can mow down Tyson Fury and Wladimir Klitchko, then all the questions will have been answered.